Like the tragic Shakespearean figures Welles so loved to portray on stage and screen, his hubris came back to bedevil him. An outraged William Randolph Hearst, who was one of the very public inspirations for the film’s tycoon hero Charles Foster Kane (played by Welles), waged such a fierce war on Welles that the film was in danger of being shelved and unseen (that drama is explored in the documentary The Battle Over Citizen Kane by Michael Epstein and Thomas Lennon and the somewhat fictionalized drama RKO 281). Nominated for nine Oscars, it only won one, for best original screenplay, an award he shared with Herman J. Herman J. Mankiewicz in another bit of Hollywood humility–Welles had, quite publically, tried to take full screen credit for the film. The film, though hardly a flop, was not a hit—the Hearst papers saw to that, refusing to run ads or even mention the name of Welles in its pages (that lasted until the 1970s)—and Welles was no longer Hollywood’s Golden Boy. 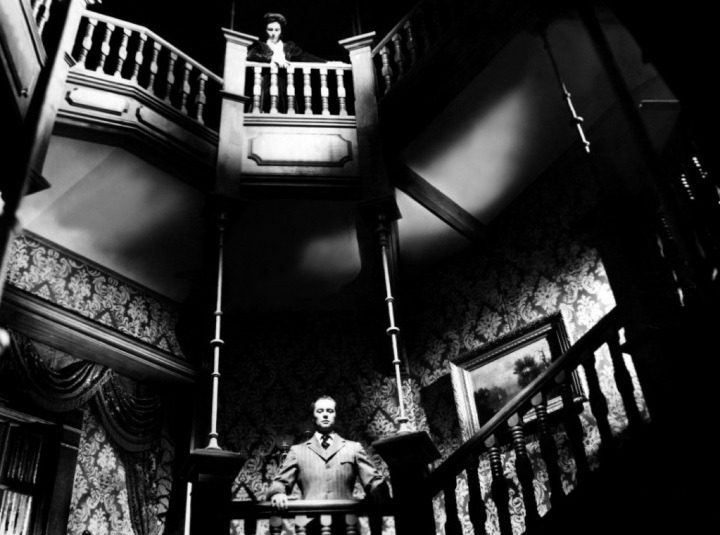 His next film, The Magnificent Ambersons (1942) was taken from his hands and recut in his absence, yet it remains one of the greatest evocations of the turn-of-the-century and possibly Welles’ greatest film. Where Kane was fast and frenetic, the clipped pace of a city-based newspaper drama, Ambersons revels in sweeping long takes and Griffith-like compositions, the evocation of the gentle pace of small town life and the idyll shattered by the coming of the automobile. But it went woefully over budget and the release was effectively sabotaged by RKO (who, after hacking 40 minutes from it, released it as the bottom half of a double bill with a Lupe Velez Mexican Spitfire comedy). The studios branded him profligate and uncommercial and he lost control of all future Hollywood pictures (which, it should be noted, were projects not of his choosing). He appeared in almost anything to scrape together money for his own independent productions, sacrificing his name and reputation as an actor in pursuit of whatever film he was directing. He died leaving a handful of films and projects in various stages of completion (some practically done, others only tantalizing fragments), unable to secure completion funds. It had become a self-fulfilling prophecy: embarking on self-financed films because no producer would invest in a director with such a track record of unfinished projects, ultimately forced to abandon them because of lack of resources, chocking up one more ‘bad debt’ to his record. William Randolph Hearst could have devised no better revenge. “I started at the top and have been working my way down ever since,” Welles used to joke. His films tell a different story. The Lady From Shanghai (1948) may be a logical mess as a mystery, but the story of corrupt manipulators, shady charlatans, and tragic fools fits right in with the Welles world view. It’s a dazzling piece of cinema that culminates in one of his most famous scenes: the justly celebrated hall of mirrors, where he shatters his distorted portrait with jagged violence. His baroque masterpiece Touch of Evil (1958) is a sleazy, grimy, jittery, and ultimately delirious work of cinematic magic. He put the technology of Hollywood through its paces with riveting camerawork, breathless editing, and a densely woven sound design. Neither films were released as Welles intended, but in 1998 producer Rick Schmidlin and Oscar winning film and sound editor Walter Murch used Welles’ notes to reconstruct it according to his vision. Every biographer has their own take on him. To Simon Callow (Orson Welles: The Road to Xanadu, 1995) he’s the needy center of attention whose desire for fame in the arts overtook his interest in the fundamentals. To David Thomson (Rosebud: The Story of Orson Welles, 1996) he was the manipulative, self-absorbed artist who never again achieved the artistic promise of Citizen Kane. To Charles Higham (Orson Welles: The Rise and Fall of an American Genius, 1985) he was his own worst enemy, purposely sabotaging his own productions out of fear of completion and failing in grand martyr-like style. Not that Welles’ own words were any more reliable, though both Barbara Leaming’s book (Orson Welles, 1985), which verges on autobiography so firmly is it entrenched in Welles’ own version of events, and the Peter Bogdanovich interview book (This is Orson Welles, 1992) are both fascinating insights to the man for those very reasons. 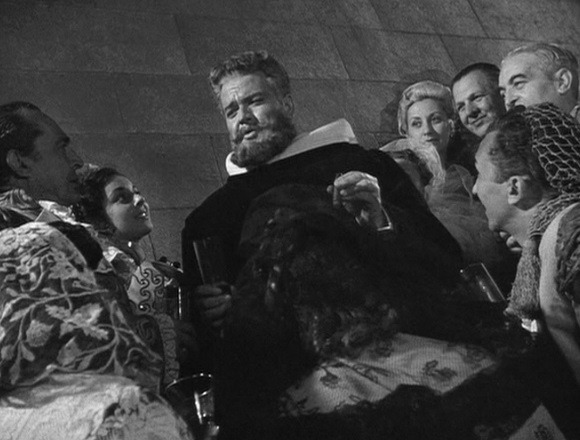 The truth obviously lies somewhere between for, with all that has been researched and recorded, Welles remains something of a conundrum: as enigmatic as Charles Foster Kane, as contradictory as Hank Quinlan, as tragically self-destructive as Falstaff. A single sketch of Welles is all but impossible. “For 30 years people have been asking me how I reconcile X with Y! The truthful answer is that I don’t. Everything about me is a contradiction, and so is everything about everybody I know,” he told Kenneth Tynan in 1965, and although I agree with Welles’ own premature epitaph in Citizen Kane (“I don’t think any word can explain a man’s life”) perhaps no other insight so neatly points to the essential basis of both his art and his life. ‘If he’d only compromised,’ his critics complain, ‘if he’d played studio politics he wouldn’t have squandered his talents.’ Welles tried that once. The Stranger (1946) became his first and only hit but did nothing to improve his reputation. So he made the compromise that defined the rest of his career: he made films on his own terms and thus traded the technical resources and distribution guarantees of the studios for the shoestring budgets and cobbled-together shooting realities of independent production. A Faustian bargain indeed—decades later it’s still his Hollywood productions that are seen and talked about, and such masterpieces as Othello (1952) and Chimes at Midnight (1965) relegated to afterthoughts. 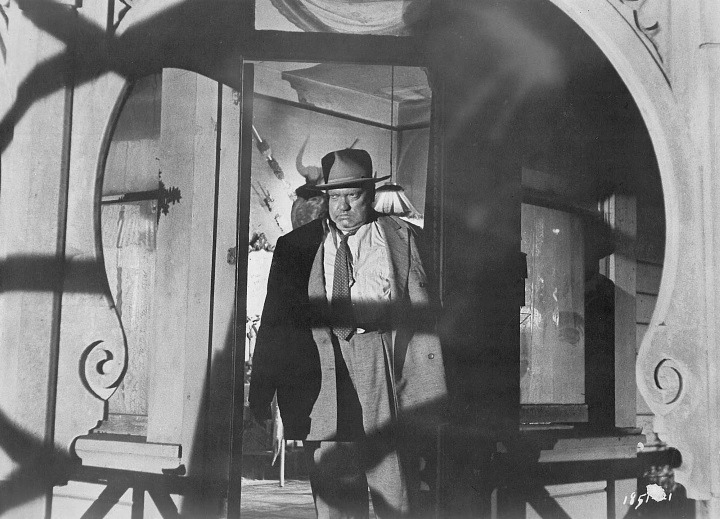 Certainly the shooting and post-production tools at his disposable outside of Hollywood were deplorably primitive compared to the studios resources for even a low budget production as Touch of Evil, and Welles’ own constant tinkering, reediting, and even post-production rewriting and constant dialogue looping lend a distinctly unreal quality to his films (as if realism was his aim!). But to become caught up in what these films are not is to miss what they offer: rich character studies, spellbinding editing, stunning images, and a cinema of complexity that asks – demands – the viewer sit up in attention and work with it. 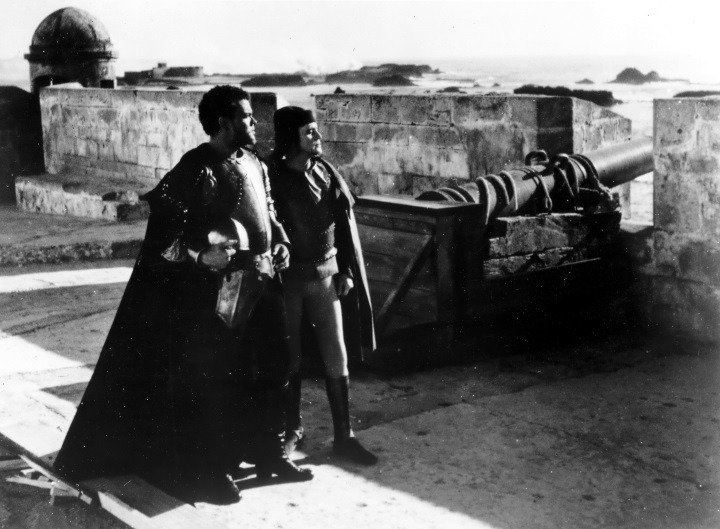 The labyrinthine world of Orson Welles hides its truths in a maze of facades and delusions, power games and moral trials, pride and ego and need and defiance rolled into characters at once monstrous and sad. Of course Welles is most renowned for his flamboyant style: jackhammer editing, arresting compositions, baroque sets, a multi-faceted, vitally alive visual world that so stunningly paints the tangled puzzle in physical terms, a world at once terrifyingly real and absurdly unreal. It’s a vision at once terrifyingly real and absurdly unreal, navigated by a contradictory, self-destructive, larger than life hero. Can Welles the man be found in his art? Aspects, yes, but never in full, for as any artist draws upon himself and puts a piece on display, it is only a piece, a glimpse, a tantalizing reflection like one of the mirrors in The Lady From Shanghai. The film career of Orson Welles becomes that hall of mirrors, but as biography it is just as distorted and grotesque and unreliable. No, the canon of Welles ultimately offers the work of an artist whose career has too long been wrapped in the mystique of its creator.